For the month of December 2018, the ministry of domestic trade and consumer affairs (KPDNHEP) has lowered the price of RON 97 petrol to RM2.50 per litre. This represents a massive 31 sen decrease from last month, whereby the fuel retailed at RM2.81 per litre. The new price will come into effect from midnight tonight and remain in place until December 31, which is when the next monthly RON 97 fuel price announcement will be made. 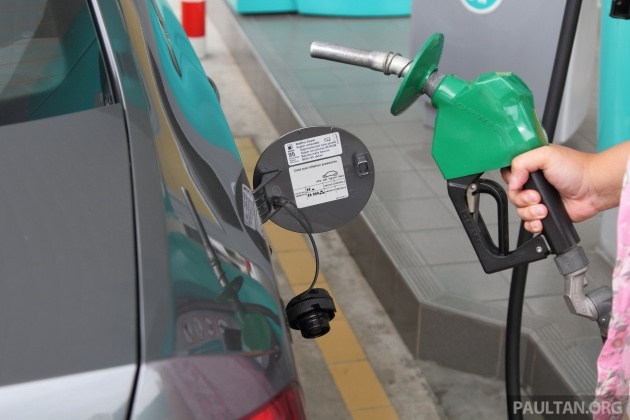 Meanwhile, the price for RON 95 and diesel remain unchanged as they have been since May 30 – RON 95 continues to be priced at RM2.20 per litre and Euro 2M diesel at RM2.18 per litre, while Euro 5 diesel is priced at RM2.28 per litre at the pump. These prices will remain fixed indefinitely. I beli Civic 1.5TCP at tax holiday. Gomen gips Rm15000 diskaun ..
New Government gives us cheap petrol. Last time, the previous Government, because of massive corruption the past 60 years, they gave us such expensive prices….sampai RM2.70 also got. Gotta hand it to you, you’re one persistent rodent. you really don’t know how to stop making an arse of yourself. Keep it up, the world needs a-holes like you. Syukurr pipu kat Malaysia , masih aman murah. I hope our regular penipu does not come here and still insist RM1.50 petrol mana? I rather believe a learned Tun who was our previous PM for over 20 years and is also PM now than a keyboard warrior who is frustrated that he lost his dedak income. I just keyed in “rafizi 1.50” on YouTube and Bamm!! i just keyed in 30% car price reduction and so many BN Menteri also promise us that. I just keyed in price reduction and walah! Already reached 16% and was heading downwards before PeroTiga. Now all car prices are goig up. Even Camry went from 160k to 180k now. Crude oil up, RON97 price down again?! I am so glad we have a clean Government who gives us fixed RM2.20 petrol for Ron 95. If follow kerajaan lama, I think now already RM3 per litre. Eh, petrol prices going down?? Basher say prices of petrol going up etc. Cukurrr!!! Kerajaan prihatin.. Boleh jimat belanja. Rm50 penuh troli! Rm 1.50 nasi lemak mana ? Tunjukkan di mana, muka surat berapa dalam manifesto PH petrol rm1.50? Tunjuk lah, mesti tak boleh kan sebab tak pernah wujud manifesto ini. Eh eh. Bijak sangat nak lari dari janji ye. Didn’t Atuk said Manifesto is just a guideline and cannot be trusted 100%? So if what they said back then cannot be trusted and what they written now also cannot be trusted, how to trust this Govt?! Give me back my old Govt! See RIP comment above. Again, dun bring ur dupe stupidity to reply me. Go do it among ur dupe names. fuh…lucky got no load yesterday and today. This morning, December 01, 2018 at 9.22am I went to PETRONAS station and pumped RON97 and discovered that they are still charging RM2.81 per litre which is supposed to be RM2.50 per litre. I approached the counter staff and was told that they have not update. My question is when price increased they update immediately. Is this petrol station trying to cheat on those who don’t check. It happens. Nothing is perfect. My station was affected too. Noticed it right after midnight. Instructed staff to stop selling 97 because late price update. station bosses are lazy. They need to update themselves quicker. How come Paul Tan got the news faster than station owners? yup, like we dealers can magically control info flow through vsat or internet or the back office system like some Gandalf the wizzard… we got the price update heads up as well, but we cant manually change the price willy nilly because we dont have the authorization codes/password/master id. if youre in the business youd know that, but youre not so stfu. grow a brain cell first rodent. Ignore him la. Empty can make the loudest noise. Aik aik aik basher say Harga barang semua melambung. Pulak saya nampak harga kereta dah jatuh, harga minyak dah jatuh, harga broadband pun dah jatuh. Aik harga jatuh? Gomen bkn janji kasi free ke?? All I see is prices going down. Even harga rumah also dropping now. Goodbye with fake news from our regular troll and his 20 other dupes. When price goes up by midnight all stations will increase to new price, when it goes down they will wait till morning newspaper announcement. When sugar goes up one Rgt. all restaurants including stalls will increase the price by ten cent per cup/glass. Which means if they use one kilo for upto 20cups they make two Rgt per kilo extra. When price goes down one Rgt. they won’t reduce their price because works out into decimal cts. Always consumer is the looser.